The Fisher Gold Bug 2 has been regarded by many as the most sensitive VLF detectors available for finding tiny gold nuggets. Although it was introduced back in the 1990’s, many experienced gold hunters are still using it today. In 2010, Fisher came out with several new metal detector models including the Gold Bug, Gold Bug SE, and Gold Bug Pro. All of these new option caused both excitement and confusion among gold nugget shooters. With the exceptional reputation that the Gold Bug 2 had earned over the past decades, many were optimistic that the newest offerings by Fisher would excel at finding gold. If you are a dedicated gold nugget hunter and are strictly looking for gold nuggets, then the Gold Bug Pro is the best choice among these new models offered by Fisher. Although similar in appearance to the others, its specific features make it the best choice of hunting gold. The real question is, how does it compare to the amazing Gold Bug 2 in regards to sensitivity and versatility in the goldfields? As with most things, it is not a simple comparison. Each metal detector has areas where it excels and areas where it is limited, so let’s discuss a few of these. First, let’s look at the sensitivity of each detector to small gold. Simply put, after using both detectors, I can confidently say that the new Gold Bug Pro does not match the legendary sensitivity of the Gold Bug 2 in regards to detecting small nuggets. With its high 71 kHz operating frequency, the Gold Bug 2 has been routinely finding tiny specks of gold that most other detectors just can’t locate, and my experience has shown that the new Gold Bug Pro will still miss some of those tiny nuggets that the Gold Bug 2 can find. With that said, there is more to consider than sensitivity alone. One downside of that extreme sensitivity is that the Gold Bug 2 can be quite difficult (to nearly impossible) to operate in highly mineralized ground. Areas that are littered with hot rocks and extreme mineralization can mask the sound of those small gold nuggets. The new Gold Bug Pro , with an operating frequency of 19 kHz, has been designed to better handle these conditions. It is my understanding that the designers were looking to make a more user friendly detector, and in this regard they really did a good job. 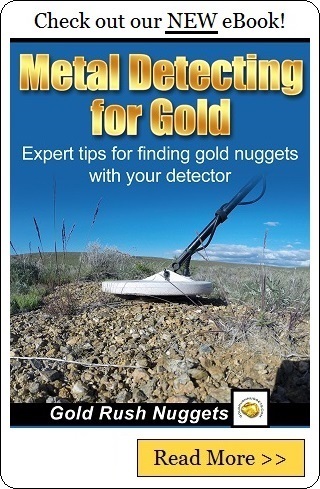 The Gold Bug Pro is one of the easiest detectors to learn, and in only a few short hours of detecting I feel that a beginner should have a good understanding of the unit and how it operates. Without a doubt it has a much shorter learning curve than the Gold Bug 2. One other feature that is quite impressive is the iron discrimination feature in the detector. Unlike the Gold Bug 2, the Gold Bug Pro has a visual target ID that will give you a numerical readout on signals. While many experienced nugget hunters don’t feel that they need this feature, for a beginner who hasn’t quite trained their ears to what a nugget sounds like, this can be a great addition. It does an exceptional job of identifying trash targets. I should mention that you should always operate in All Metal Mode, rather than try to discriminate out the iron targets, as you will no doubt miss gold due to the decreased sensitivity. Instead, rely on the visual indicators and sounds produced to determine whether or not to dig. For both detectors, read the manual and be sure that you understand it inside and out. In short, both the Gold Bug 2 and the Gold Bug Pro are great detectors that will do a fine job of finding small gold nuggets. In my experience, the Fisher Gold Bug 2 is still King when it comes to sensitivity and its ability to those tiny gold nuggets that others have missed. The Gold Bug Pro, while not quite as sensitive, may very likely excel in areas with hot rocks and mineralized ground. Due to its short learning curve, I feel that the Gold Bug Pro is still a fine choice for a beginning gold hunter, or someone who is hunting a very trashy area and needs a detector with a quality discrimination feature. If you are metal detecting in hard hunted areas and are searching for those tiny specks of gold that others have missed, the trusty Gold Bug 2 is still the detector of choice.